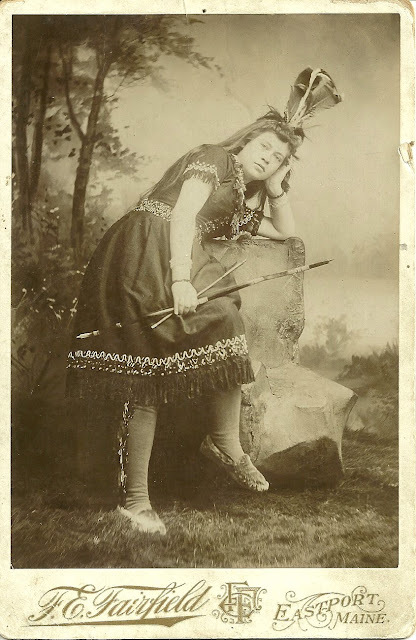 1894 cabinet photo taken by F. E. Fairchild, Eastport, Maine, of an unidentified young woman posing in Indian costume against a stylized background. There's a settlement of Passamaquoddy Indians adjacent to Eastport at Sipayik (Pleasant Point, Perry, Maine), so it's possible that she was Passamaquoddy, but the whole staged scene makes me doubt she was. What's intriguing, though, is the possibility that the photographer might have purchased the dress and moccasins from a Passamaquoddy seamstress. 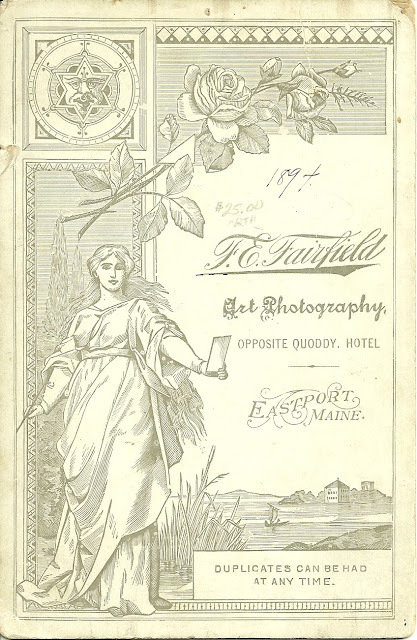 Having been born and raised in Eastport, Maine...there is no doubt in my mind that the young woman in this photo is NOT of the Passamaquoddy tribe.